26 January 2020 Sunday Kidlington 800 Official Launch Service: 10.00am with The Bishop of Oxford at St. Mary The Virgin Church, Kidlington. 1 February 2020 Saturday Kidlington 800 Gala Dinner: from 6.00pm [details TBA]. 29 February 2020 Saturday Antiques Evening & Auction: from 6.00pm [details TBA] with Mallam's auctioneers. 6-7 June 2020 Sat & Sun Open Gardens: Kidlington and Hampton Poyle. 27 June 2020 Saturday Olympic Fete: from 2.00pm [details TBA] Village Fete based on an Olympic theme! October 2020 Concert: [details TBA] featuring a range of local musical talent. December 2020 A parade of camels: [details TBA] from the High Street to St Mary's Church Nativity Service. 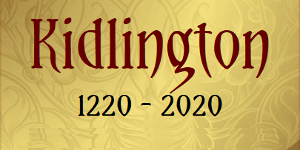 1The Year 2020 is an important year for Kidlington and Hampton Poyle as it marks 800 years since the two St. Mary's Churches were built. Ensure that your organisation has a place in the parade.